« What will replace bitcoin? For earlier versions of these charts, see our June article. 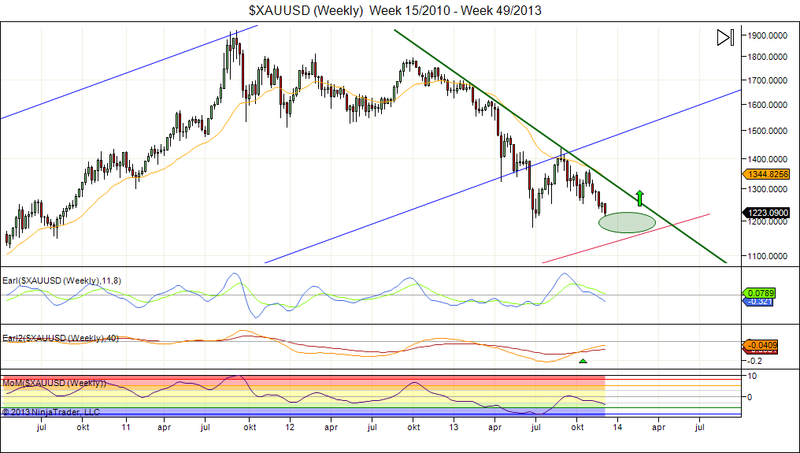 Gold has dropped to $1215, one of the bottom targets we mention in our weekly key reversals posts. So, this is a good opportunity to update the long term charts. 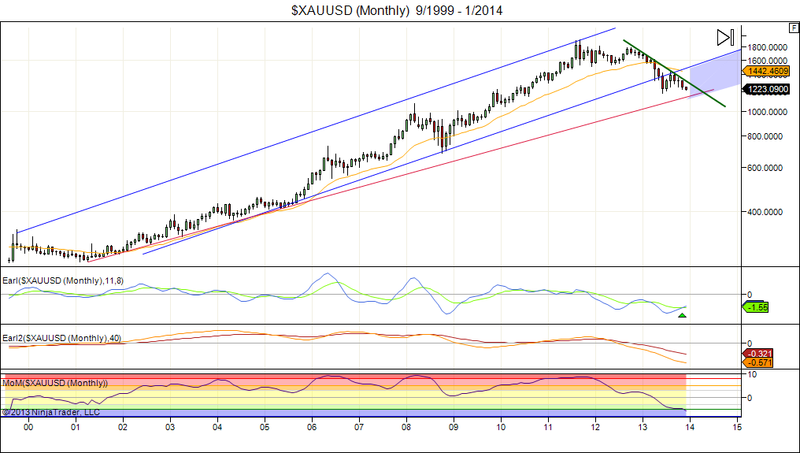 Gold appears to be forming a base near $1200 on the monthly chart. The Earl indicator is turning positive already. The slower Earl2 is close to bottoming out. Meanwhile the MoM has fallen into the blue zone, and it hasn’t been this depressed since 1999. If gold can break above the thick green resistance line, then it will go on to trade in the area marked with a blue parallelogram next year. This means +20% upside potential. Here the Earl2 is improving already while the Earl is close to bottoming. We may get a bottom in December (tax selling?) or January, but as long as gold stays above the summer lows it won’t take much to force a breakout to the upside. Shorter term we see a bullish divergence in the Earl indicator with the slower Earl2 ready to bottom out. Also here the MoM has dropped into the depressed blue zone, which is what you typically see before the start of a significant rally. Based on this chart a December bottom is more likely than a January low. So, the weak hands have been shaken out (if not gone short), and the media continue to tell us that gold has only further to drop. But on three different timescales my indicators are saying: BUY. 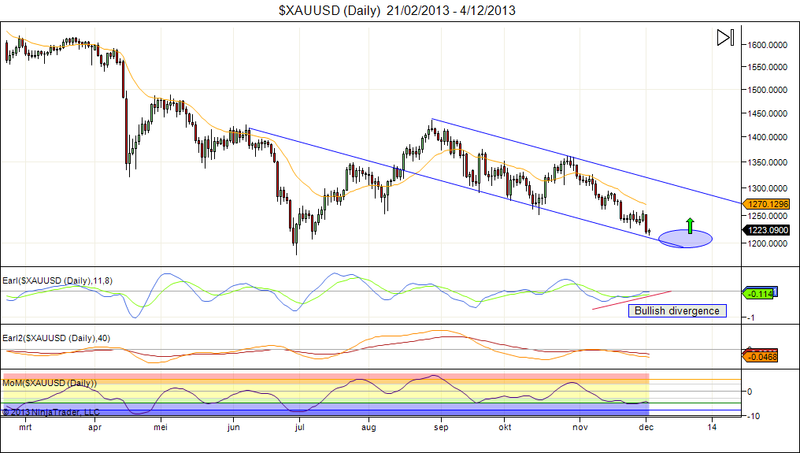 My own guess: gold will see a rebound next year, possibly stretching into 2015, with a target ~1500. That will get a lot of investors very bullish again, forecasts of $3000 or $5000 gold will make their comeback, and then another leg down will start. This is called: shearing the same sheep twice. Of course, I could have it all wrong, as always. If gold drops below $1150, then I will have to write off this scenario. This entry was posted on December 4, 2013 at 2:22 pm	and is filed under Market Commentary. Tagged: gold, long term. You can follow any responses to this entry through the RSS 2.0 feed. You can leave a response, or trackback from your own site. good read.. let’s see if the market will show the bottom.. I dare not to predict if it will bounce up..
It’s probably never “safe” to predict anything in the market. And whenever it feels safe to make a certain prediction it probably also feels safe for many other investors to make that same prediction at the same time… which usually results in the market doing something unexpected..
Could gold go on to erode slowly for years, without any rallies, like e.g. coffee (KC) has been doing for a few years already? It’s possible, but it’s quite rare to see something like that. I think gold will be lower in 2018-20 than it is now, but I don’t think it will get there in a straight line.